Veterans will already know these tricks for how to save money on Warhammer 40K, but if you’re new to the game then there’s a lot to be learned because Warhammer 40K is expensive. There are a lot of little ways you can save money when you buy for Warhammer 40K, especially when you’re just starting out. When you’re new to the hobby you’re in need of everything. The range of things you need to buy is large, so it’s easy to find most of it at a discount. If you don’t mind having to strip paint, fix damage, or reassemble models, then eBay is where you’ll save the most money for any army – hands down. Also, sometimes you’ll have to settle for older models, like earlier sculpts (often metal). However, if you’re like me, then you’ll find having classic models mixed in with newer ones just makes things more visually interesting. Here’s a list of specific sellers on eBay worth checking out. Thanks to Dave for providing most of these. These are listed by country, but you’ll find most will ship internationally. Blackdagger Games – Bits seller with a fair collection. Hoard O Bits – Used these folks a few times for bits. Great selection and fast shipping. The Warstore – Same shop you’ll see listed below in online retailers, but this is their eBay shop. I’m not 100% sure they’re still using it though, FYI. Amazon will have a handful of retailers selling new packaged boxes of almost every kit that Games Workshop offers. The discount tends to be anywhere from 10% – 25%; sometimes more and sometimes less. These are the folks who sell the product through their own website. Generally you’ll save a bit off retail when you buy 40K products through them. Thanks to Cylde for the list for Spain. Some of the UK stores I know nothing about, however, they came at the recommendation of Dave, so I’ve included them. Element Games – They don’t have as large a selection as Wayland Games does for 40K, but they also offer a 15-25% discount off items. Wayland Games – A large online retailer in the UK. The discounts range around 20% for most stuff you’ll find. Chaos Orc’s Superstore – I haven’t bought from them in a while, but they were always great when I did. Hoard O Bits – Same folks mentioned above in the eBay stores. You can save a little more by buying direct from them. The Bitz Barn – They used to have their own store, but apparently now they’re selling on Amazon. Good selection of bits anyway. The Warstore – The biggest and best discount retailer in the US for wargaming. The major focus on this article is on the models. That’s where you’re going to spend the vast majority of your money in the hobby of 40K. However, new players will need to buy a rulebook and a codex for their army. , and the online retailers above. If you would like a list of every 40K army with their respective codex then I’ve got you covered. Optionally, you can go the digital route as well and get them cheaper than the physical equivalent. These starter sets can be rare gems. I say rare because these don’t come out often and they get bought up quickly when they do. A starter set usually comes out when there’s a new edition of 40K. The starter set will contain dice, rules, and two small armies so you can learn the game. The models used in the starter sets are unique to the starter set, so you can’t buy them on their own. This makes buying one appealing to veterans, but there’s other reasons veterans like them as well. The other reason, the major reason, people like buying these 40K starter sets is the cost. Often times these starter sets will save hundreds of dollars over buying the components on their own. If you’re new to 40K then a starter set is a great way to jump into the game, assuming you’re interested in one of the armies in the set that is. A lot of people will go halves on a starter set with a friend who wants the other army. Veterans will buy the 40K starter set to get the few things they want and then eBay the rest for a profit. You really can’t go wrong with getting one. containing two armies, the Death Guard and Ultramarines. It also contains the rules for the game, psychic powers, and everything you need to get going in 8th edition. There’s is a HUGE savings in this starter set. featuring something new, Necrons and Mechanicum. There’s some exclusive models inside too, which is making it really popular. It does also contain the core rules for 8th, and some supplements to play a campaign featuring those two armies. and has some very cool exclusive models. that originally came out for 6th edition, and was later revised for 7th edition. So, this will contain a defunct rule book, but it’s still a great buy. It has miniatures for both Dark Angels and Chaos Marines. and save a fair bit of cash with it. Again, go-in on this with a friend to save money, or sell off the other army on eBay for a profit. Most every army has one of these, a box that bundles a few units together and offers it at a discount of around 25%. These army bundles, now called Start Collecting!, are perfect for newer players. The units offered tend to be fundamental units to that particular army, so ones you’ll want to own. As such, it’s a bit less appealing to veteran players, as they often own those units in quantity already. However, sometimes the Start Collecting! sets will contain units of interest even to veteran players. Below I’m going to attempt to break down each army and the bundles available to them. Note though that not all armies have bundle deals, so you won’t see every army below. Also, all the pricing is in USD, so you’ll have to convert as needed. See the Start Sets for the breakdown of this. with all the units being useful. You’ll have a solid foundation to build your army up from with this. This is another defunct formation set from 7th edition. Still, if you like Terminators then this might be worthwhile. This is a classic board game from Games Workshop. It’s gone through a few different versions and remains a favorite of many gamers. Oh, it’s also not available unless you find people who stocked up on it; and you will. Other than being a good board game, it also has some really nice models. and save a fair bit of change. There’s quite a few ways to save with Daemons. in here. Chariots are a lot better under 8th, and Seekers are extremely fast and capable. With the changes in 8th, Tzeentch units have improved. This is really a great buy for any fan of Tzeentch. There’s quite a few options for Chaos Marines. 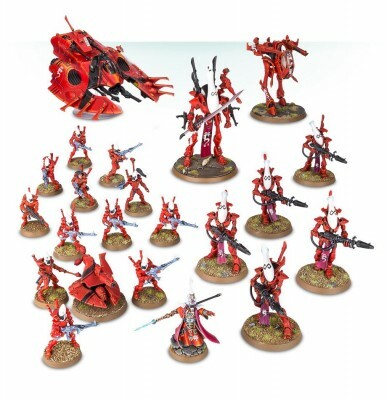 They’ve often been one of the armies in the 40K starter sets, plus they have a few other bundles.
. Chaos Space Marines aren’t terribly efficient despite being a core Troop for CSM. The Chaos Lord and Helbrute are good though, so it comes down to what you’re after. A 30K board game that focuses on the Thousand Sons losing their homeworld to the Space Wolves. and save some money for sure. You can find the details in the Starter Sets. More info on this in the Officio Assassinorum section. Check above in the Chaos Marines section for details. for any new Eldar player. Seems this one is now gone. A great starting point for any new Eldar player. Yet another great deal for Eldar. As with the Start Collecting!, this is a worthwhile buy to get a great start on an army. Look above in the Starter Sets area for the breakdown on this one. Details can be found above in the Starter Sets. Jump down to the Genestealer Cults area for more info. This is the Deathwatch side of Overkill. All the models are exclusive to the set. Also, thanks to TheRhino for pointing this one out that I had missed. On a related note, if you’re interested in learning more about Kill Team then check out that great guide by Game Cows. for any new Drukhari players out there. Another side game of GW’s that people just buy for the models.
. There’s some great support units in there if you’re after a more rounded force. if you want Genestealer Cult stuff. Check the Blood Angels section for a breakdown. A brand new offering containing Genestealer Cults and Space Wolves. on this, especially if you can find someone to split the box with if you don’t need one half of it. These suckers are expensive, so thankfully you can get some savings. This is a box that comes with 2 Knights (Imperial & Renegade), as well as some cool industrial terrain. In addition, it’s a complete game as well so that you can duel with your Knights. The game itself is pretty simple, and people just buy this box for the discount on the Knights, but some people seem to enjoy it. with Tempestus if you’re interested. for a new Necron player to get some core units. Scroll up in the Start Sets section for a breakdown. While not technically an army, there is a great deal for getting all 4 assassins. just to get the Assassins. You’re saving a bit if you can sell off the other army, or have someone go-in on the game with you. as well. Currently Orks are waiting on a codex, so the true merit of this set is yet to be determined. My personal favorite way of running Orks – fast! if I were starting Orks again. If you like speed, and want some firepower, then this is a worthwhile buy. , be it Blood Angels, Dark Angels, etc. Of course the models will be generic Marines, so no specific insignias, but if you don’t mind that then it’s a good buy for any chapter. off a new Marine army. This is a 30K board game. Of course, everyone just buys it for the models. Now, being that this is set in 30K, not 40K, the Marines are wearing MK4 armor and the Terminators are Cataphractii. , save some money, and get some cool looking Marines. Scroll up to the Starter Set section for more details on this one. There’s a bit of savings and they are all units you’ll likely use in a Space Wolf army. See the Genestealer Cults section for details on Tooth and Claw.
. The Ethereal is not the number one HQ pick for most, but this kit is worth it alone for the Crisis Team and the Fire Warriors. This one may be gone for good now. If you want to get into T’au and get a good chunk of the army at once then here you go. There’s a lot in there and it’s a pretty reasonable buy. as well. Genestealers are amazing in 8th edition. Looks like GW removed this one. This is a great jumping in point for any new player. This will get you well on your way to a swarm of bugs. Not the most amazing savings, but it’s something. I figure foam trays for your miniatures is worth mentioning as well. Most of us use them to put our models into, and as long as you’re buying models you’ll need foam trays. There’s no denying that Battle Foam has become the gold standard of foam trays, but it’s also very expensive. I’m not saying it isn’t worth the money, however, if you’re looking to save a few bucks then you can check out my tutorial on making your own foam trays. I also have a site dedicated entirely to miniature storage solutions you may be interested in. That blog covers everything from foam trays, to carrying cases, and even paint racks. Not the most fun thing to read about, but I’d like to think it’s useful information. , and you’ll be surprised how much money you can save. That should cover the major deals on how to save money on Warhammer 40K. I will try to keep this updated and current, but if you know of something I’ve missed then please let me know in the comments. Also, I feel this is important to mention. Please be sure to also support your local hobby store(s). Getting deals online is great, and we all want to save money, but remember that it’s the local stores that are the lifeblood of the gaming community. Be sure to spread your business around a bit and help support the places you play. Well that was a superb article. Well thought out with a dozen ways to tempt me into new armies. I must resist. Cheers for taking the time to do such a good run down. It was a ton of work, but hopefully its serves as a great resource for people. I’ve added those stores to the list above now and broken things down by country. I really appreciate you sharing those. There’s just so many places to buy that it’s hard to keep up, nevermind track ones in another country. The Dark Vengeance set is also noteworthy because some of the Cultists from it (functionally speaking, the Champions, Flamer, and Stubber) haven’t been released anywhere else. There are also a few places that Conversion can save some cash with fairly minimal work. SM Veterans are probably the best example. Slap some scopes on your Tactical Marines’ Bolters and as much other bling as you can fit and bam, now they’re Sternguard. Only you just got 10 for $40 instead of 5 for $50. The Burning Chariot of Tzeentch is also a fantastic deal. Beyond the options given, it’s also possible to convert it into a Herald on a Disk, which normally costs as much as the whole Chariot kit, and then leaves you with 3 Blue Horrors, an Exalted Flamer, and (with some cutting and trimming) a pair of Screamers. Oh, right. Forgot that some of those Cultists are exclusive. Oh, yeah, and one more for the SM Players: Never buy Rhinos. $4 more for a Razorback sprue on top of the regular Rhino stuff is a steal, and it’s incredibly easy to leave the two top plates swappable. And with a few Plasma Pistols you can convert the Ravenwing Bikes into Black Knights, even more savings. I didn’t read the breakdown of everything once you got into the saved dollars, but FYI the entire Deathwatch side of Overkill is now available by itself in one box. Kill Team Cassius costs $65. I completely overlooked that. Thanks. Also of note is that lots of the stuff Hoard O Bits sells on ebay is actually cheaper of you buy direct from their website. Usually about 10%, because they’re not having to pay the eBay fees for sales. I totally forgot they had a site. Thanks again! Betrayal at Calth 150$. Comes with 30 space marines 5 cataphractii terminators, 1 Comptemptor dreadnought, one captain in atapharctii armour, and one “officer”. Burning of prospero 150$. 30 space marines, 5 tartaros terminators, 5 custodians, 5 sister of silence and two characters. Awesome. Thanks again for these. And, what do you think of blightwar box to get daemons of nurgle?. Then you can sell the Sigmarines. I just added them. Gracias! I’ll have to check it out – Blightwar. I’m not familiar with the set, but if it’s a discount then I’ll definitely include it. It is an AoS box, but nurgle daemons are the same. 160 $. Same daemos than start collecting nurgle, minus the herald and with a Horticulous slimux. And the stormcast eternals. I’ll add that in the list then. Thanks! I think another way of saving money, or at least getting better value, is buying forces that can be used in more than one system. Chaos Daemons are the ultimate example, since they can be used in 30k (with Word Bearers), 40k and Age of Sigmar. Its also quite easy to build a Space Marine, Mechanicus, Renegades and Heretics or Guard force that is useable in 30k and 40k. Genestealer Cult forces can be used in 40k and Necromunda, and other Necromunda gangs could find roles as Cultists in a Chaos Space Marine army, as acolytes in an Inquisitorial warband in 40k, as part of an Imperial Guard army (depending on the gang), or even in a 30K Militia/Cults list. If you want to be truly flexible, using ‘Imperial’ vehicles with a simple single colour scheme, and keeping any icons/spikes/trophy racks removeable (use magnets or just blue-tack) means you could use the same vehicles for multiple armies and periods. Black vehicles for example could be used in Black Legion, Iron Hands, Black Templars or Raven Guard armies, and in 30k and 40k. Then you could play as Loyalist or Traitor for the marginal cost of the extra infantry. All very true. There’s definitely a lot of potential to cover the modeling opportunities in another article entirely. I think we’ve all learned a few tricks over the years for each army. Great article! will be a handy resource to send people to when they’re considering venturing into a new army!